CRACKLED GLASS NICKEL COLLECTION: FORM AND FUNCTIONALITY IN A STUNNINGLY MODERN DESIGN! Tired of plastic bath accessories that break easily and look totally old-fashioned? Looking for a way to change your bathroom decor while staying on a budget? The Crackled Glass Nickel Collection of bath accessories is sure to make a bold statement in any bathroom! 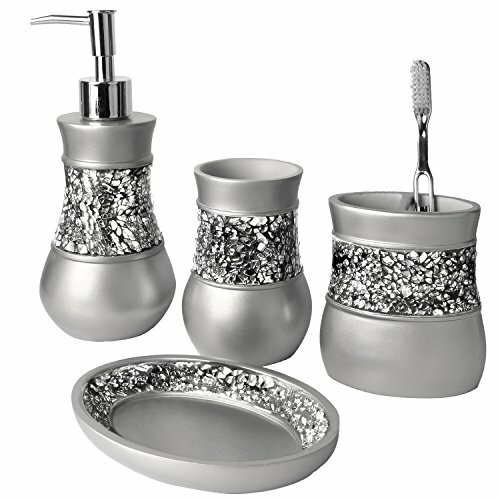 This 4-Piece Bath Accessory Set stands out through its unique, visually-appealing design, which sports a brushed pewter finish topped off with crackled glass for a contemporary feel. The set is made of durable resin that can easily last for a lifetime, withstanding constant use while keeping its appearance just as stunning over years. In addition to its great look, the Crackles Glass Nickel Collection provides great functionality to any bathroom. You'll get all accessories that your bathroom needs to be fully functional: 1 lotion/soap dispenser, 1 toothbrush holder, 1 tumbler and 1 soap dish. Now you can offer your guests more than just one option for washing their hands! The metal pump on the soap dispenser is durable and works smoothly, whilst the soap dish will snugly fit atop the sink! Made of quality resin that's guaranteed to last for a long time. Unique, visually-appealing design complements any modern bathroom. Sports a brushed pewter finish topped off with crackled glass. Perfectly accommodates the needs of multiple users, so it's the most suitable choice for both master and secondary bathrooms. Great gift idea for spa lovers! It's time for a makeover - your bathroom deserves it! Click the "Add to Cart" button to order the Crackled Glass Nickel Collection of bath accessories now! FASHION-FORWARD BATH ACCESSORY; the Brushed Nickel Collection sports a brushed pewter finish topped off with crackled glass for a contemporary feel. This bath accessory set is sure to elevate the look of any bathroom decor and also add functionality! Plus, this is a fail-proof gift idea for spa lovers! DURABLE RESIN LUXURY SET; this 4-Piece Bathroom Accessory Set is made of durable resin that's guaranteed to outlast competing products. Our quality resin bath accessories will resist to constant use, keeping their look just as spectacular and luxurious over time. MULTIPLE USERS; the Crackled Glass Nickel Collection has been specifically designed to fit the needs of multiple users. This set is just perfect for any modern master or secondary bathroom, and will definitely make a bold statement and a strong impression! MULTIPLE USERS; need a new bath accessory set in your secondary bathroom? The pieces in this collection are large enough to accommodate the needs of multiple users and make a strong impression that will last! Backed by a LIFETIME GUARANTEE, this is totally risk-free buy; so order with confidence. CLICK the Orange button to Order Now!